W H A T_ I S_ I T? The Villa was the life residence of the Austrian artist Neo Dietrich, known for human projects all over the world (cooperations with Kofi Annan, Masaru Emoto, Karl-Heinz Böhm, UNO, SOS-Kinderdorf,...) who built an astonishing paradise on earth surrounded by pure nature. His saying was "Paradise is a state of mind and not a place" and this absolutely unique piece of land amidst the Austrian woods reflects in a miraculous way the paradisiac mindset of it's former resident! You are looking for relaxation, silence and peace? You want to enjoy the pure nature and all it's facilities? You just want to focus on your current project or piece of work? You do not want to be disturbed in any way except of the bird's twittering? You need time to write a book, a song, get some inspiration, connect to your inner self or just wait for the kiss of the muse? You want to have a nice time with your friends or family? Then just leave society for a certain period of time and enjoy your stay in the romantic, artistic austrian villa "Neo's Paradise" on a glade in the middle of a forest. You are in a totally peaceful heaven of tranquillity and nature but still very well located for touring the beautiful region. You can stay here alone, with your spouse, with some friends or with your whole family - the property has plenty of space to offer! The artistic Villa offers a living space of 200 sqm, a gallery of 70 sqm, a working space of 500 sqm, a terrace with 70 sqm and a lawn with 10,000 sqm including a natural swimming pond. The two buildings which are now connected have a long history of formation. The main building with the bathrooms, living rooms and bedrooms has been a tavern back in the 1960s and shelter for the workers of the nearby stone quarry. The second house - the artist's workroom, atelier and studio was an old farmstead, build in 1622, located in a neighbor village, which should be destroyed but was cut into 4 pieces and transported in 1997 with unbelievable efforts about 20km to it's new location - the paradise glade! The two buildings are connected in the middle through a terrace roof, which offers 70 sqm place to lay in the sun, relax or work and enjoy the beautiful sight! The water system is independent from the local community, it's supplied by the nearby hill's natural water spring! In front of the entrance door you'll find the fountain, old German called "Graunta". For the not-so-warm season: the main building is heated with a firewood oven, which spends authentically warmness and harmony but also a gas heating is installed. The "City of Three Rivers" is also notable for its gothic and baroque architecture. The town is dominated by the Veste Oberhaus and the former fortress of the Bishop, on the mountain crest between the Danube and the Ilz rivers. It is the most beautiful and traditional city of germany and maybe central europe, with all it architecturial highlights, the living cultere, the great history and also a great nightlife , Munich is absolutely a must see if you're visiting Europe. It is the birth city of the famous composer Wolfgang Amadeus Mozart. Salzburg's "Old Town" (Altstadt) has internationally renowned baroque architecture and one of the best-preserved city centres of the Alps. The village Hallstatt is such an unbelievably spectacular place that even the Chinese have created a copy of the ancient salt mine village. But only in the original will you discover this truly unique culture with such a history all in a breath-taking mountain setting. The Salzkammergut (literally translated: Property of the Salt Chamber) fulfils the ardent desire for vitality and zest for life! It is one of the most beautiful holiday regions in Austria, with its name coming from its history. Sparkling clean lakes, green hills, wonderful mountains, romantic towns and cities (like St.Wolfgang and Hallstatt) make up this magical region that is filled to the rim with scenic beauty and a rich local culture. In a nearby village, called Kopfing, you'll find the world-famous "Baumkronenweg", a trail above the crowns of the trees supporting an absolutely astonishing sight above the far-reaching woods of the so called "Sauwald" ("forest of the pigs"). Within 1 hour by car there are also a lot of famous lakes, like Attersee, Traunsee, Mondsee and Wolfgangsee to visit. So this is definitely the place for relaxation, silence and inspiration! We are looking forward to your contribution to this ambitious project! Neo Johann Dietrich was my father, inspirational teacher and mentor - I am the inheritor and new landlord of the property. Sleeps up to 6 people!! The Villa was the life residence of austrian artist Neo Dietrich, known for human projects all over the world (cooperations with Kofi Annan, Masaru Emoto, Karl-Heinz Böhm, UNO, SOS-Kinderdorf, ...) who built an astonishing paradise on earth surrounded by pure nature. His saying was "Paradise is an attitude of mind and not a place" but this absolutely unique piece of land amidst the austrian woods reflects in a miraculous way the paradisiac mindset of it's former resident! 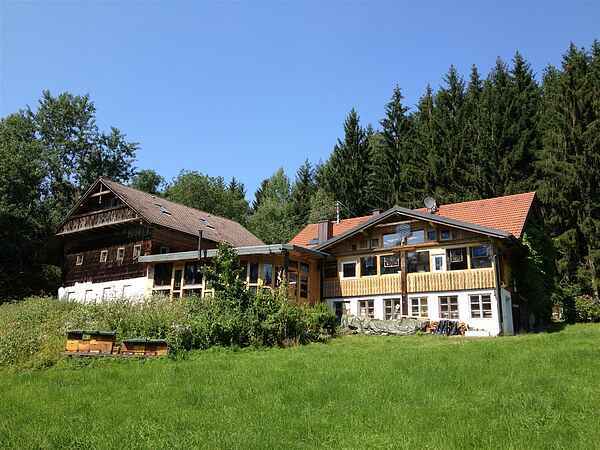 Then just leave society for a certain period of time and enjoy your stay in the romantic, artistic austrian villa "Neo's Paradise" on a glade in the middle of a forest. You are in a totally peaceful haven of tranquillity and nature but still very well located for touring the beautiful region. You can stay here alone, with your wife/husband, with some friends or with your whole family - the property has plenty of space to offer! The artistic Villa offers a living space of 200 sqm, a working space of 500 sqm, a terrace with 80 sqm and a lawn with 10,000 sqm including a natural swimming pond. The two buildings which are now connected have a long history of formation. The main building with the bathrooms, living rooms and bedrooms was in the 1960s a tavern and shelter for the workers of the nearby stone quarry. The second house - the artist's workroom, atelier and studio was an old farmstead, build in 1622, located in a neighbor village, which should be destroyed but was cut into 4 pieces and transported with unbelievable efforts about 20km to it's new location - the paradise glade! That was in 1997! The two buildings are connected in the middle through a terrace roof, which offers 80 sqm place to lay in the sun, relax or work and enjoy the beautiful sight! For the not-so-warm season: the main building is heated with a firewood oven, which spends authentically warmness and harmony (also a gas heating is installed) but also with a gas heating. Neo Dietrich was my father, inspirational teacher and mentor - I am the inheritor and new landlord of the property.